Hope to see a few there! 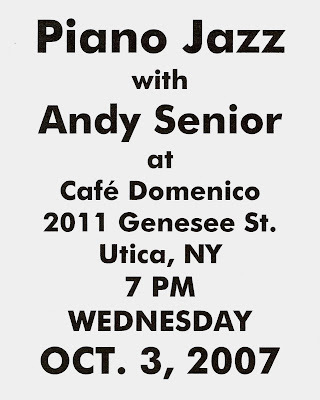 I'm scheduled to play piano at Cafe Domenico, 2011 Genesee St, Utica, NY (phone 315-798-8077) on Wednesday, October 3, at 7 PM. Domenico's is directly across from the Uptown Theatre. You'll hear pop standards played in stride and swing, with a respectful nod to Waller and Tatum. And yes, this is my first engagement in about five years--I'm back! AL GALLODORO IS BACK THIS SATURDAY! KEEPING THE BEAT! THE AL GALLODORO QUARTET with JoAnn Chmielowski, piano; Ryan Cyrbus, Bass; and Lou Colone, drums; at SEGO CAFE, ONEONTA, NY, Saturday September 22, 8-11PM. Dr. Alfred J. Gallodoro (born June 20, 1913) is still keeping the beat with his new state of the art Pacemaker implant! At over 94 years young, Gallodoro continues to thrill his listeners with his impeccable musicianship and incredible mastery of his instruments. His admirers include more than just saxophone aficionados--he recently appeared twice at Cornell University's Weill Medical College for concerts and as the subject of an extensive interview on longevity and vitality. Al is one of only 13 artists who recorded before 1940 that is still active and recording, During a professional career spanning an amazing nine decades, Gallodoro has played his saxophone, clarinet and bass clarinet in all forms and venues of music. Al was called upon in April 2006 to perform George Gershwin’s Rhapsody in Blue with the NYC Harmonie Ensemble, a piece for which he holds the distinction of a world’s record--over 10,000 performances throughout his association of nearly four decades with the “King of Jazz” Paul Whiteman. For more information, please visit the Official Al Gallodoro Website. Tune in tonight at 8 PM ET to WHCL 88.7 for a show that materialized miraculously when a nice bundle of new CDs arrived in today's mail. The rest of the program delves into the theme in typical RADIOLA! fashion. Just a little something to tide you over until Friday--dig Red McKenzie on the soundtrack!